Surrounded by giant Douglas Firs, Pier Park’s tennis court is the coolest place to play in Portland on a hot summer day. Friends of Pier Park volunteers turned out to re-stripe the tennis courts at Pier Park in 2011. Because of budget cutbacks the tennis courts at Pier have been officially decommissioned. 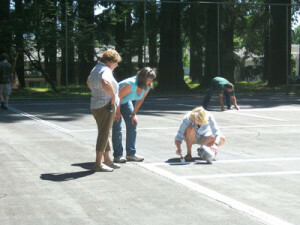 This means that when it comes time to repaint the courts, volunteers turn out! Friends of Pier Park is considering whether to raise funds to resurface the tennis courts at Pier Park. What do you think? Would you prefer to pay on smooth courts without cracks and crevices? Come to the next Friends of Pier Park meeting and let us know.